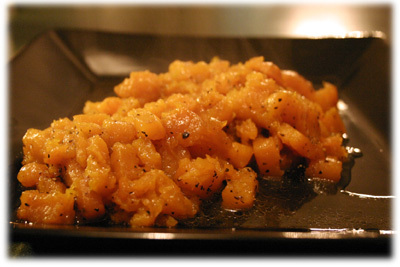 Cooking butternut squash in foil on your grill is actually easier and tastes better than if you cooked in your oven. It's a very simple ingredient list but because they're all sealed in foil as they cook the flavors are more intense. And the really good thing about using your grill is it frees up your oven if you need to cook other things at the same time. Using only 5 ingredients is what makes this recipe easy. Using these particular 5 ingredients together is what makes it taste incredible. enough aluminum foil to wrap all the ingredients without leaking. 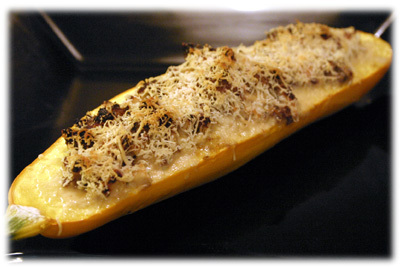 Select a large firm butternut squash and slice it in half lengthwise. Peel and remove the seeds from the squash. 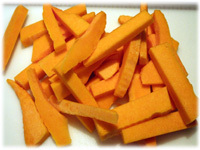 Cut the squash into slices the shape of french fries. Tip: Some grocery stores are now selling pre-sliced and pre-peeled squash if you'd prefer to save some time. 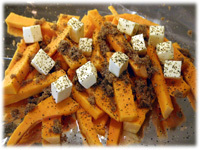 Place a large sheet of aluminum foil on your work surface and place the pieces of sliced butternut squash on the center of the foil. Sprinkle the brown sugar over the squash. Place the cubes of butter evenly over the surface of the squash. Sprinkle the salt and pepper over everything. 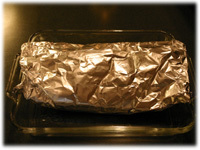 Carefully seal the aluminum foil with the butternut squash inside so nothing leaks out as it's cooking. This is probably the most important part of cooking anything wrapped in foil on the grill! Nothing worse then melted butter dripping down on the flames and causing a major fire in the grill. Setup the grill for indirect cooking and heat to 400F. 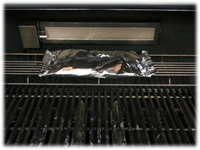 When the barbecue reaches this temperature place the foil package on the grates (not over direct heat) and close the lid. You're cooking this squash recipe for 45 - 50 minutes however after 25 minutes flip the foil package over and close the lid. Tip: If you have a small warming rack above the main grates that's a perfect spot to put this package of squash like the picture. I'm not using the rear infrared burner though. 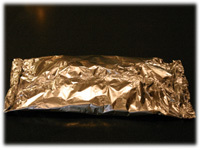 After 45-50 minutes remove the foil packet from the BBQ and place it in a shallow dish. Carefully cut open the foil pack and spoon the cooked squash onto a serving plate and serve immediately. There could be a lot of steam so watch your hands. This makes a great side dish for both chicken and pork.